EQyss Premier Equine Shampoo and Conditioner Rehydrant Spray Dual Pack offers everything you need to clean your horse and maintain her healthy coat. This pair of pet cleaning products is formulated specifically for horses and offers a method of grooming that is effective and comprehensive. Premier shampoo contains no silicone, oil, wax, petroleum, or synthetic polymers that are normally found in pet shampoos to prevent residue on horses after cleaning. 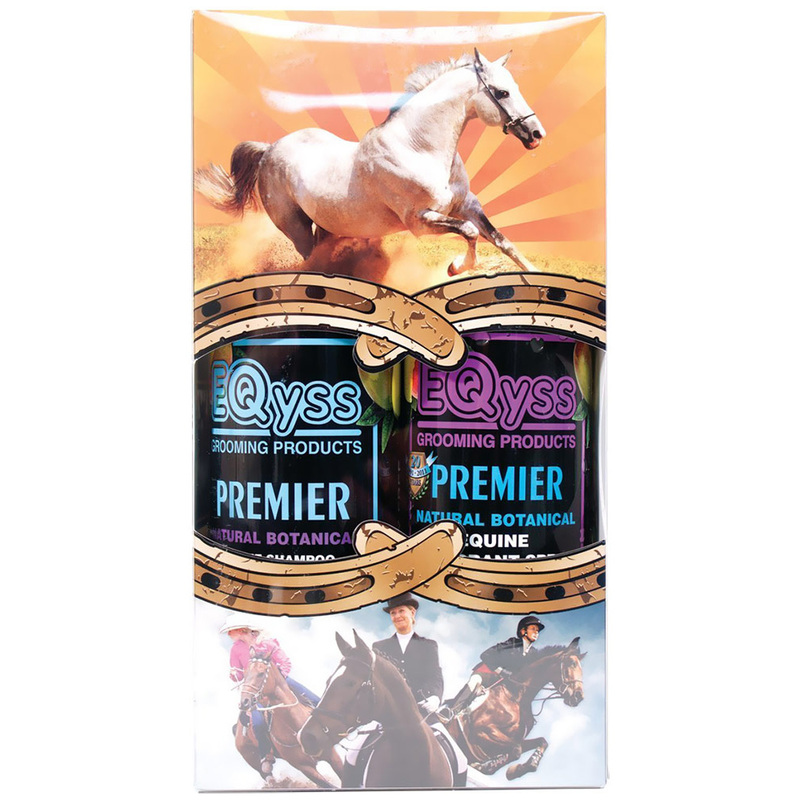 EQyss Premier Equine Dual Pack bundles the aforementioned shampoo with a premier botanical spray for rough, matted manes to remove tangles and shines and moisturizes your horse's coat. When the pair of products is used together, your equine will be left with a clean and soft coat. Ingredients: Deionized Water, Sodium Laureth Sulfate, Soyamidopropyldimethylamine Oxide, Cocamidopropyl Betaine, Glycol Stearate (and) Laureth-4, Palmitamidotrimonium Chloride, Polyquaterium 10, Aloe Vera Barbadensis, Sodium PCA, Acetamide MEA (and) Lactamide MEA, Glycosaminoglycans, Extracts of: Urea, Citric Acid, Methylparaben, DMDM Hydantoin, Tetrasodium EDTA, Salt, FD&C Blue #1, Fragrance. Ingredients: Deionized Water, Sodium PCA, Cetrimonium Chloride, Propolene Glycol, Aloe Vera Barbadensis, Glycosaminoglycans, Polysorbate 20, Polysorbate 80, Citric Acid, DMDM Hydantoin, Methylparabem, Tetrasodium EDTA, Defoamer, Fragrance. Directions: Dilute 2 or 3 ounces of Premier Shampoo in a bucket of water, Shampoo, rinse and scrape dry. For enhanced shine mist entire coat, mane and tail with spray. Directions:After washing with PREMIER SHAMPOO, rinse, scrape dry and mist entire coat, mane and tail with Premier Rehydrant Spray. Do not rinse. Use as often as desired on dry horse, particularly after brushing!